Kermanshah or Kermashan is a city in Western Iran. Kermanshah is the central city in the west of Iran, has a large population. The languages spoken by the people is Kurdish, Southern Kurdish, Laki and Also Persian. Kermanshah developed in the 4th century AD under the patronage of Sassanian kings. Briefly renamed Bakhtaran in the 1980s. Its climate is mild and it has many natural and historical sightseeings in the city and in the towns around. The city is 525 km southwest of Tehran at the foothills of the Zagros mountain range. The city enjoys a temperate climate and regular seasons. Kermanshah has an international airport(IATA:KSH), (ICAO: OICC) that can be reached from some airports in Iran, especially from and to Tehran, Mashhad, and Shiraz, Esfahan, and Istanbul on international flights. The only international airline in Kermanshah is Turkish Airlines. Passengers from almost all over the world can easily fly to Kermanshah four days a week by Turkish Airlines. Kermanshah railway station was inaugurated in March 2018. There will be two weekly direct trains to Tehran and Mashhad. Kermanshah is well-served by highways. You can hire a car to see the sightseeing in the nearby towns, however the easiest way to travel in the city is via taxi. There are buses to Kermanshah from Tehran Shiraz, Esfahan, Mashhad, Tabriz and many other major cities. There are bus groups going to Karbala through Baghdad in Iraq everyday, but first you should go to a travel agency. Kermanshah has an simple bus network with two terminals in the Azadi Square. As with the rest of the country private and shared taxis are abound in Kermanshah. Kermanshah Monorail is under construction. Irankhodro industrial group, has been awarded the Kermanshah Monorail project. TAM will design and construct all parts of the project including trains, electrical and mechanical equipment, civil structure of the route, switches, stations and a storage/maintenance facility. 14 four-car trains will be capable of carrying up to 16,180 passengers per hour. Completion is expected in 42 months. There are four museums that are established in old houses of Qajar period. These are Museum of ethnography at Tekyeh Moavenalmolk, and two museums of Zagros Paleolithic Museum and Museum of epigraphy and Qajar hand writings at Tekieh Biglar Baigi. 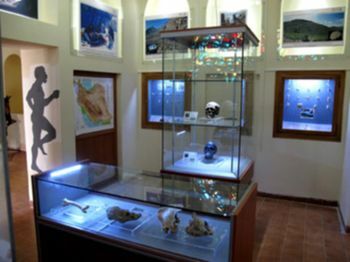 Zagros Paleolithic Museum: The Zagros Paleolithic Museum contains rich collections of stone tools and animal fossil bones from various Paleolithic sites in Iran. It is the first established museum in Iran that devoted to Paleolithic period of Iran. Museum of traditional Martial art:Museum of traditional Martial art (Wrestling موزه پهلوانی) is another museum in Kermanshah that was established recently and contains many wax models of traditional wrestlers. Talab-e Hashilan: There are tiny flouting islands in this marsh with various plants sheltering 200 sorts of birds. The 1500-hectare marsh is 32 km distant from Kermanshah. Prav Cave in the Prav Mountains between Taq Bostan and Bisotun heights is the deepest cave in Asia (the deepest cave in the world is Ali-Sadr Cave in Hamedan northeast of Kermanshah). 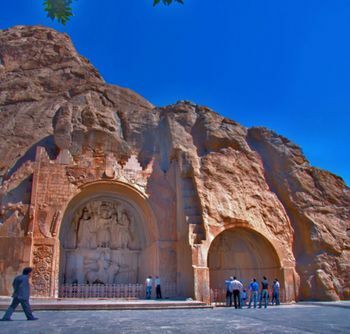 There are famous glaciers and a marvelous 762-meter deep valley in it with several streams.Qoori Qal'eh cave is another of the natural wonders of the province, located 92 km from the city heading toward Paveh. The cave's spine is 3,140 meters long and the cave-length is 12 km with a beautiful natural surrounding of a variety of forest trees. In the cave, the first phase of which has been developed, there is an ever-flowing stream of 111 liters per second, and chambers with enchanting icicles and colorful columns. In fact, it is a romantic sight never to be forgotten. Taq-e Bostan. One of the most impressive reliefs inside the largest grotto or ivan is the gigantic equestrian figure of the Sassanid king Khosrau II (591-628 CE) mounted on his favorite charger, Shabdiz. Both horse and rider are arrayed in full battle armor. Mo'avenalmolk Museum. 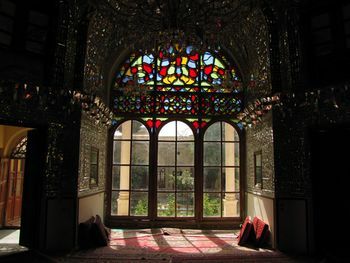 This museum is unique because it has many pictures on the walls that relate to shahnameh,despite some of its more religious ones. The Mo'avenalmolk museum was commissioned by Husayn Khan Mu'ini al-Ra'aya, a well-known merchant in the Kermanshah bazaar, and built in 1897. Originally built as a husseiniya, it was partially destroyed in 1909 by enemies of its patron. It was bought in 1912 by Hasan Khan Mu'ini Mo'avenalmolk , who renovated it, adding two new components, a zainabiyeh and an abbasiyeh, to the tekkiyya. During the Iran-Iraq war, the building was partially destroyed, and was subsequently renovated post-war. The structure is known for its dramatic and colorful tile mosaic panels, which depict religious stories and their principal religious, historical, and political protagonists. Tekye-ye Biglarbeigi is one of the old and important buildings of Kermanshah which sits in the old part of the city opposite to Friday Mosque. The construction of of the building began in 1892 by Abdollah Khan Farrashbashi, known as Biglarbeigi. The building was completed in 1898. The stucco work and mirror work decorations were completed in 1909. This building has an impressive space and beauty. It consists of mirror worked hall, several rooms, alcoves, porticos, and a central big courtyard. This yard has beautiful mirror works, stucco decorations, inlayed decorations, and sash windows. It has three entrances. The main entrance is in the northeastern side. The pediment of this entrance has plaster vaults and stucco decorations. Dont hesitate to talk to people, especially youths. Almost all of them speak English well enough to talk to you, answer your questions and chat with you. They're all very welcoming and like getting into conversation with you. Some of them might even invite you to be their guest. Retail stores usually open between 09:00 and 13:00, reopening again from 16:00 to 21:00. It is customary to haggle for a discount, which is referred to as a takhfeef. Yahoudi-ha Bazar (Jewish Bazar) or (Islami Bazar) - It is one of the oldest shopping centers in Iran from Qajar period(1785-present) in which you can find traditional clothes, the Kurdish traditional cloth, miscellaneous spice, Giweh, hand made metal knife, hand made leather, and some blacksmith stores, and some stores which sell distilled water from medical plants and flowers. You can also find lots of dried plants. The Bazar is easily found when walking in the street due to the strong smell of the spice. In the past, this shopping center belonged to the Jews. The Kurds Bazar or (Tarikeh Bazar) - In this shopping center all kinds of jewelry and some special cookies like Nan Berenji Kaak and Naan Khormaei which are the famous souvenirs of Kermanshah are sold. 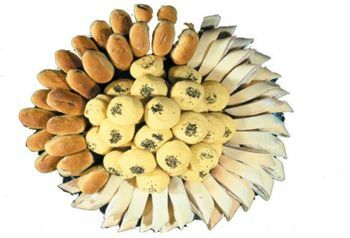 Naan Roghani: It is a kind of sweet bread mde of sugar and local traditional oil. Nan Berenji and Nan Shekari: They are special cookies made in Kermanshah for many years and passengers buy them as souvenirs. Kaak: A kind of cookie which is in bar shape. Naan Khormaei: It is a kind of cookie which is made of a mixture of date, walnut. Roghan Kermanshahi: It is a kind of local traditional oil which is made from cow, sheep and goat milk. It has special taste and aroma. Dande Kebab: It is a speciall Kebab of Kurdish nomadds of Kermanshah. Here as with most of Iran, the standard national dish of Chelo kebab is a must. 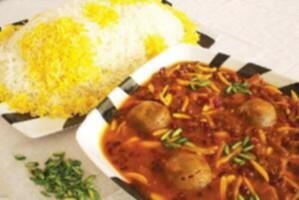 Try the regional variations of this dish in the numerous restaurants in Kermanshah. Food is usually of high standard. In some parks in Kermanshah, you can simply obtain a carpet and tea from the park warden, and have a picnic on the grass! You will find families gather in these parks, and bring barbecues and cook freshly made k'ebabs, which smell (and taste) delicious. Zagros 1: Zagroses Fast Foods are eminent and famous in Kermanshah. the cafes on Nobahar street. Doogh is a popular and delicious naturally-carbonated yogurt drink. It is generally served with ice and a dash of mint. Distill's - Kermanshah have many kind of aromatic distill's. Azadegan hotel is a large hotel located near the monuments in Kermanshah in Vahdat Blvd, Taavon. There are various Internet cafés in Kermanshah which have fast connection. The relief figure of Darius I and its inscriptions are among valuable remains of the Achaemenid era. These stone inscriptions are the most important written documents of ancient Iran. They are hewed on the mount Bistoun. An English Archeologist spent eighteen years to decipher the inscriptions. He could read the old Farsi writings and discovered the mystery focuneiform signs. 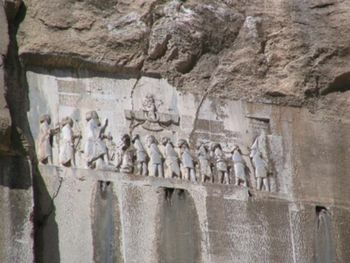 The inscriptions and the figure of Bistun are on a nearly inaccessible high rock. This figure depicts Darius and the war prisoners. There are two attendants behind the king. A captive is under his horse and nine captives of different countries with tied hands and necks are before him. The inscriptions lie below and on the sides of this figure. The part in old Persian is carved in five lines below the figure. The Elamite inscription is on the left and the Babylonian section is above the on the left figure. There are some other inscriptions on the right of the figure . Geomat Magh is lying on the ground stretching his hands for pity. Darius is bigger than the others in the figure. This is similar to the figures of Darius in Perspolis. 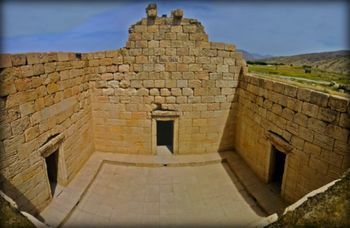 The anahita temple is the name of one of two archaeological sites in Iran that is belonged to the ancient deity Anahita. The eminent one is located at Kangavar that is in eastern Kermanshah Province, on the modern road from Hamadan to Kermanshah, identical with a trace of the silk road. The other is located at Bishapur.The remains at Kangavar reveals Persian architectural designs.The site has ruins of debated date and nature. The ruins of the so-called temple of Anahita sit in the middle of the city of Kangavar on the way to Hamedan. 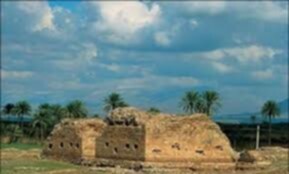 As usual with ancient Iranian temples, the Anahita is also called Nahid- temple sits on a hill. It is erected on a hill in an artificial terrace 32 meters higher than the surrounding land. The sanctum has a square 209 by 224 meters design, each side being an 18 meters high platform. There is double staircase, which is 154 meters long, in the southern part of the temple. At present, the eastern staircase has 26 stairs and the west one has 21 steps. This sanctum is attributed to the Arsacid era. Some potteries, coins, graves, and clay coffins belonging to the Arsacid era have been discovered in this temple. Some Sassanid remains have been found in the excavations of this area, too. In Qasr-e Shirin, Kermanshah city, There is the remains of the Carvansarai Safavid period which is a place like hotel in the site houses, a collection of monuments located within a perimeter northeast of Qasr-e Shirin . This site also includes such architectural and urban remains from the late Sassanid period and the early Islamic period as the palace of Khosrau II, this is attributed to Sassanid period and the Chahar Qapu monument, remains of a stone tower known as Ban Qal'eh, this one belongs to Sassanid period and the early Islamic period. 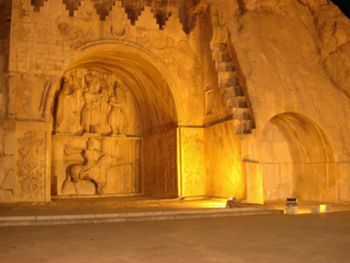 It is a historical monument of the Sassanid era in Qasre- Shirin. It was constructed of stone and gypsim and was counted as one of the largest five temples of the Sassanid period. The fire temple has a square shaped chamber in the center woth a domed ceiling , which closely resembles the other fire temples of the period. This page was last edited on 18 February 2019, at 21:39.